Good nutrition and effective learning go hand-in-hand. Numerous studies have documented the value of eating breakfast and its contribution to a child’s ability to learn, think quickly, pay attention, and get along with others. One recent childhood nutrition study found that children who eat breakfast improve their math grades, school attendance, and punctuality. Children who regularly eat breakfast also think clearly and quickly, solve problems more easily, and are less likely to be fidgety and irritable early in the day. Studies also show that children who skip breakfast are not as adept at selecting the information they need to solve problems. Ability to recall and use new information, verbal fluency, and attentiveness are all negatively affected by hunger as well. Breakfast plays an important role in our child nutrition program. 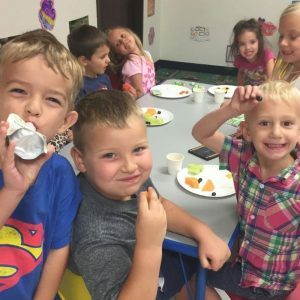 Our team at Valley Child Care & Learning Centers believes that even the best preschool and child care services can’t provide effective learning for children who are hungry, which is why we’ve developed a program that allows you and your child can start your day off by eating breakfast together! Just come into any of our locations between the hours of 6:00 a.m. and 8:00 a.m. to enjoy a bowl of cereal with juice or milk (coffee for parents) at no charge. As part of our complete child nutrition program, your child will enjoy morning and afternoon snacks and a lunch that is nutritionally balanced and meet the required food components and portion size at each meal. We encourage the children in our day care and early learning programs to at least try every food group that is offered, and once they are done eating, your child may have second helpings of anything we serve. All of our meals are homemade and meet USDA Daily Requirements. If you have any questions about our nutrition policies and programs, or you have concerns about your child’s dietary restrictions, contact Valley Child Care & Learning Centers today! We would be more than happy to lend a hand.